No, that isn’t one of my misleading provocative titles. I’m not going to be all clever and then reveal that I, like every woman my age, think Darcy is just the most wonderful thing ever. He’s not. He’s kind of awful. If you haven’t read Pride and Prejudice–or at least seen the BBC movie–you might just want to skip down a few paragraphs. Any Twenty-something Girl: Oh, I love Mr. Darcy! ATG: Yes, he’s just so perfect. Me: But he’s arrogant and condescending and really quite awful. Me: Yes, he is. For the entire first half of the book, he does absolutely nothing to recommend himself. ATG: But then he loves Lizzie and she brings out what’s good in him and because of her, he becomes this amazing guy! This is the part where I start spluttering. 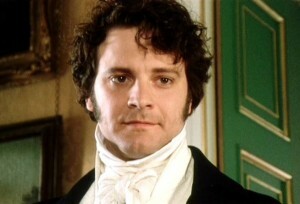 Now, all you P&P lovers out there, I don’t mean to say that Darcy should be dismissed entirely. I appreciate that he helps Lydia and I respect the way that his servants and his sister love him. I think it’s fair to say that deep down he is a decent guy. I have a real problem with his being the standard to which every man is held (in some circles) as I think he’s a fairly pathetic standard. He’s arrogant, unkind, and insensitive until he’s got some reason not to be. Certainly he’s very good to Lizzie once he falls in love with her–well, after his proposal, which is so insensitive as to be cruel. But a man’s character is defined not just by how he treats those he admires but even more by how he treats those he despises–and Darcy despises most people, so we’ve got plenty of evidence as to his character. Now I’m not saying he can’t change. I absolutely believe that we can, by God’s grace, defeat our vices and grow in virtue. God, I hope we can–the idea of being as loud, emotional, and attention-seeking at 40 as I was at 14 kind of makes me want to die. But I can’t sit back and watch women use Darcy as an excuse to date losers. Oh, they may not make the argument that their stoner boyfriends are just as misunderstood as Darcy, but there’s an attitude that women are already inclined to have that Lizzie and Darcy just encourage: I know the real Fitzwilliam and I can help him to be the great guy that only I can see. I’ve watched more women make this mistake. They date guys who booze or cheat or sulk or lie or whatever but they really believe that the glimpses of good they see are their boyfriend’s real self. And if they can love him enough to draw that real self out, then not only do they get an awesome guy, but they also get to be his savior! I’m going to be real with you, ladies. If your friends think he’s a jerk and your family thinks he’s a jerk and his friends think he’s a jerk and his family thinks he’s a jerk, you’re not finding the heart of gold beneath the rough exterior. You’re being fooled by a jerk. Or, more often, you’re fooling yourself because you just really want him to be great. It’s been my experience that most guys will be as good as you require. Men are hunters by nature; they’re built to chase down the mammoth and they’ll fight until they’ve killed it. Forget chastity here (okay, never forget chastity, but you get my point), but I’m not talking about keeping your clothes on so that he’ll marry you. I’m just talking about character, about the way a man will do anything to win the heart of the woman he loves. If you’re interested in a Darcy and you try to date him so that he reforms, he’s just going to congratulate himself on having captured his prize and see how far he can coast before you freak out about how awful he is. If, on the other hand, you hold out like Lizzie, he may just surprise you, as Darcy, to his credit, ends up doing. See, you’re incredible. You really are–you’re beautiful and captivating and absolutely worth fighting for. You were born a princess, living protected atop a high tower. But high towers get lonely. And you might look out the window and see, for example, a farm boy covered in muck. And maybe you two make eye contact across the distance that separates you. And you begin to think how handsome he is under the caked-on manure. And how he has such sensitive eyes when he bothers to look up at you. And really, how unreasonable of your parents to demand that you marry someone of consequence–they just don’t understand! So you sigh and you pine and you wait, but he’s just mucking around with the pigs. And at this point, you have to make a choice. Most Darcy-lovers of my acquaintance are inclined to rip up their fancy bedsheets, make a rope, and climb down to the sty, after which they are chafed and muddy and in the company of a man who now has no reason to improve his station in life, his object being achieved. Don’t even get me started on Tangled, which I also love despite the lesson it teaches. She falls in love with a con artist simply because he’s the only man she’s ever met? That’s a great model for romantic young girls. A wiser princess waits in her tower, knowing that her farmer will either move on (in which case he was never worthy of her love), or he will fight. If he deserves her, he will wash off the muck, train as a knight, slay the dragon, scale the tower, and take her in his arms. He will either stay filthy or be transformed, based entirely on what she expects of him. Now there are plenty of holy, God-fearing men out there who will fight to be good men regardless of what is expected of them. But there are many more–even really good guys–who will only fight to be good as long as it is demanded of them, ideally by a beautiful woman. But you can’t be a harpy or a nag, dating or–God forbid–marrying a mess of a boy and then insisting that he change. Even worldly wisdom knows that you can’t change somebody else. He can change himself, though. And if you refuse to compromise your values and your standards, a man who truly loves you will fight to become the kind of man who deserves you. A man who won’t fight for you never could have deserved you. Now a reasonable woman can’t be uncompromising on non-essentials. You can’t refuse to date a man because he doesn’t play the guitar or have curly hair or play football. But if he drinks too much or uses vulgar language or belittles your family or demeans you (ahem–Darcy! ), you can’t save him. You can only make yourself miserable trying. Look, I know that Darcy’s shy and socially awkward. And maybe you can convince me that his tremendous vices are really just a consequence of that. Or perhaps that he loves Lizzie so much that he reforms himself entirely in order to be worthy of her. And I’ll admit that I shriek and giggle as much as anyone every time they get together. I suppose I don’t really hate him (the reformed him, anyway) so much as I hate the way women ignore his flaws and cling to the idea that they can change a jerk into a charming gentleman of 10,000 a year. After years of hearing Austen distorted to excuse imprudent attachments (read: moronic crushes that will only end badly), I had to say this to all the lovely ladies dating scumbags and thinking they can save them like Lizzie saves Darcy: he’s already got a savior and it’s not you. If he really deserves you, he’ll fight to be a man who’s worthy of you. So stay up in your tower, princess, and watch him become the man you know he can be. And if he stays in the pigsty, count your blessings that you didn’t climb down to him. You never could have turned him into your knight in shining armor. Meg Hunter-Kilmer is a 20-something Catholic woman, totally enthralled by the Lord, His Word, His Bride the Church, and especially His Body, Blood, Soul, and Divinity in the Eucharist. After years of serving the Lord as a high school religion teacher, she's set out on a new ministry speaking at youth and adult events around the country and blogging at Held By His Pierced Hands. She is discerning a vocation to consecrated virginity, responding to a God who's wildly in love with her for no discernible reason. She loves college football, gnocchi, freeze dance parties, and books about princesses.